சிமெயுலுவே தீவுக்கு மேல் 26 மைல்கள் (42 கிமீ) உயரத்தில் இருந்து, வெடிப்பு எப்படி இருந்திருக்கும் எனக் காட்டும் படம். 6 ஆண்டுகள் எரிமலைக் குளிர்காலம், மக்கள்தொகைச் சுருக்கநிலை, பிரதேச இடவமைப்பில் குறிப்பிடத்தக்க மாற்றங்கள் என்பன. டோபா ஏரி. வெடிப்பினால் உருவான குழிவு ஏரி. தோபா எரிமலை வெடிப்பு என்பது, 69,000 - 77,000 ஆண்டுகளுக்கு முன்னர் இந்தோனீசியாவின் சுமாத்திராவில் உள்ள இன்றைய தோபா ஏரிப் பகுதியில் ஏற்பட்ட பேரெரிமலை வெடிப்பு ஆகும். இது உலகில் இடம்பெற்ற மிகப்பெரிய எரிமலை வெடிப்புக்களுள் ஒன்று. இதன் அடிப்படையில் உருவான டோபா பேரழிவு எடுகோளின்படி இந்த நிகழ்வு 6-7 ஆண்டுகள் நீடித்த உலகம் தழுவிய எரிமலைக் குளிர்காலத்தை உருவாக்கியதுடன், 1000 ஆண்டுகள் எடுத்த குளிர்வுக் காலகட்டம் ஒன்றுக்கும் காரணமானது. மிகவும் நுணுக்கமாக ஆராயப்பட்ட பேரெரிமலை வெடிப்பு தோபா நிகழ்வேயாகும். 1993ல் அறிவியல் ஊடகவியலாளர் ஆன் கிப்பன்சு இந்த வெடிப்புக்கும், மனிதகுல வளர்ச்சியின் சுருக்க நிலைக்கும் தொடர்பு உள்ளது என்னும் கருத்தை முன்வைத்தார். நியூயார்க் பல்கலைக்கழகத்தைச் சேர்ந்த மைக்கேல் ஆர். ராம்பினோவும், மனோவாவில் உள்ள அவாய்ப் பல்கலைக்கழகத்தின் இசுட்டீபன் செல்ஃப் என்பவரும் இந்தக் கருத்தை ஆதரித்துள்ளனர். 1998ல், உர்பானா-சம்பைனில் உள்ள இல்லினோயிசுப் பல்கலைக்கழகத்தின் இசுட்டான்லி எச். அம்புரோசு, மக்கள்தொகைச் சுருக்கக் கோட்பாட்டை (bottleneck theory) மேலும் வளர்தெடுத்தார். ↑ John Savino; Marie D. Jones (2007). Supervolcano: The Catastrophic Event That Changed the Course of Human History: Could Yellowstone Be Next. Career Press. பக். 140. ISBN 978-1-56414-953-4. http://books.google.com/books?id=tSIa0VQn1NQC&pg=PA140. ↑ "The Toba Supervolcano And Human Evolution". Toba.arch.ox.ac.uk. பார்த்த நாள் 2013-08-05. Ambrose, Stanley H. (1998). "Late Pleistocene human population bottlenecks, volcanic winter, and differentiation of modern humans". Journal of Human Evolution 34 (6): 623–651. doi:10.1006/jhev.1998.0219. பப்மெட் 9650103. http://www.bradshawfoundation.com/stanley_ambrose.php. Chesner, C.A. ; Westgate, J.A. ; Rose, W.I. ; Drake, R.; Deino, A. (March 1991). 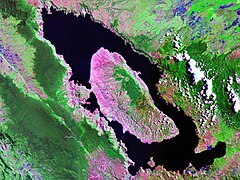 "Eruptive History of Earth's Largest Quaternary caldera (Toba, Indonesia) Clarified". Geology 19: 200–203. doi:10.1130/0091-7613(1991)019<0200:EHOESL>2.3.CO;2. Bibcode: 1991Geo....19..200C. http://www.geo.mtu.edu/~raman/papers/ChesnerGeology.pdf. Richard Dawkins (2004). "The Grasshopper's Tale". The Ancestor's Tale, A Pilgrimage to the Dawn of Life. Boston: Houghton Mifflin Company. பக். 416. ISBN 0-618-00583-8. Gibbons, Ann (1 October 1993). "Pleistocene Population Explosions". Science 262 (5130): 27–28. doi:10.1126/science.262.5130.27. பப்மெட் 17742951. Bibcode: 1993Sci...262...27G. http://www.sciencemag.org/cgi/pdf_extract/262/5130/27. Gibbons, Ann (19 January 2010). "Human Ancestors Were an Endangered Species". ScienceNow. http://sciencenow.sciencemag.org/cgi/content/full/2010/119/2. Goldberg, T.L. (1996). Genetics and biogeography of East African chimpanzees (Pan troglodytes schweinfurthii). Harvard University, unpublished PhD Thesis. Hernandez, R.D. ; M.J. Hubisz, D.A. Wheeler,4 D.G. Smith,5 B. Ferguson,6 D. Ryan,7 J. Rogers,8 L. Nazareth,9 A. Indap,10 T. Bourquin,11 J. McPherson,12 D. Muzny,13 R. Gibbs,14 R. Nielsen,15 C.D. Bustamante (2007). "Demographic histories and patterns of linkage disequilibrium in Chinese and Indian Rhesus macaques". Science (316): 240–243. doi:10.1126/science.1140462. Bibcode: 2007Sci...316..240H. Huff, Chad. D; Xing, Jinchuan; Rogers, Alan R.; Witherspoon, David; Jorde, Lynn B. (19 January 2010). "Mobile Elements Reveal Small Population Size in the Ancient Ancestors of Homo Sapiens". Proceedings of the National Academy of Sciences 107 (5): 1–6. doi:10.1073/pnas.0909000107. பப்மெட் 20133859. PMC 2836654. Bibcode: 2010PNAS..107.2147H. http://www.pnas.org/content/early/2010/01/06/0909000107.full.pdf+html. Jones, S. C. (2007). Qm9GfjNlnRwC&lpg= PP1&pg= PA173 "The Toba Supervolcanic Eruption: Tephra-Fall Deposits in India and Paleoanthropological Implications". in Petraglia, M. D.; Allchin, B.. The Evolution and History of Human Populations in South Asia. Springer. பக். 173–200. ISBN 1-4020-5561-7. http://books.google.com/books?id= Qm9GfjNlnRwC&lpg= PP1&pg= PA173. Linz, B.; et al. (February 2007). "An African origin for the intimate association between humans and Helicobacter pylori". Nature 445 (7130): 915–8. doi:10.1038/nature05562. பப்மெட் 17287725. Bibcode: 2007Natur.445..915L. Luo, S.-J. ; J.-H. Kim, W.E. Johnson,4 J. Van der Walt,5 J. Martenson,6 N. Yuhid,7 D.G. Miquelle,8 O. Uphyrkina,9 J.M. Goodrich,10 H.B. Quigley,11 R. Tilson,12 G. Brady,13 P. Martelli,14 V. Subramaniam,15 C. McDougal,16 S. Hean,17 S.-Q. Huang,18 W. Pan,19 U.K. Karanth,20 M. Sunquist,21 J.L.D. Smith,22 S.J. O'Brien (2004). "Phylogeography and genetic ancestry of tigers (Panthera tigris)". PLoS Biology 2 (12): 2275–2293. doi:10.1371/journal.pbio.0020442. பப்மெட் 15583716. McGuire, W.J. (2007). Gpwgm022ltMC "The GGE Threat: Facing and Coping with Global Geophysical Events". in Bobrowsky, Peter T.; Rickman, Hans. Comet/Asteroid Impacts and Human Society: an Interdisciplinary Approach. Springer. பக். 123–141. ISBN 3-540-32709-6. http://books.google.com/?id= Gpwgm022ltMC. Ninkovich, D.; N.J. Shackleton, A.A. Abdel-Monem, J.D. Obradovich, G. Izett (7 December 1978). "K−Ar age of the late Pleistocene eruption of Toba, north Sumatra". Nature 276 (276): 574–577. doi:10.1038/276574a0. Bibcode: 1978Natur.276..574N. Oppenheimer, Clive (2002), "Limited global change due to largest known Quaternary eruption, Toba ≈74 kyr BP?,", Quaternary Science Reviews 21: 1593–1609, doi:10.1016/S0277-3791(01)00154-8, Bibcode: 2002QSRv...21.1593O, http://www.sciencedirect.com/science/article/pii/S0277379101001548. Petraglia, M.; R. Korisettar, N. Boivin, C. Clarkson,4 P. Ditchfield,5 S. Jones,6 J. Koshy,7 M.M. Lahr,8 C. Oppenheimer,9 D. Pyle,10 R. Roberts,11 J.-C. Schwenninger,12 L. Arnold,13 K. White. (6 July 2007). "Middle Paleolithic Assemblages from the Indian Subcontinent Before and After the Toba Super-eruption". Science 317 (5834): 114–116. doi:10.1126/science.1141564. பப்மெட் 17615356. Bibcode: 2007Sci...317..114P. http://toba.arch.ox.ac.uk/pub_files/Petraglia2007Science.pdf. Rampino, Michael R.; Self, Stephen (2 September 1992). "Volcanic Winter and Accelerated Glaciation following the Toba Super-eruption". Nature 359 (6390): 50–52. doi:10.1038/359050a0. Bibcode: 1992Natur.359...50R. http://pubs.giss.nasa.gov/docs/1992/1992_Rampino_Self.pdf. Rampino, Michael R.; Self, Stephen (1993). "Climate–Volcanism Feedback and the Toba Eruption of ~74,000 Years ago". Quaternary Research 40: 269–280. doi:10.1006/qres.1993.1081. Bibcode: 1993QuRes..40..269R. http://pubs.giss.nasa.gov/docs/1993/1993_Rampino_Self.pdf. Rampino, Michael R.; Self, Stephen (24 December 1993). "Bottleneck in the Human Evolution and the Toba Eruption". Science 262 (5142): 1955. doi:10.1126/science.8266085. பப்மெட் 8266085. Bibcode: 1993Sci...262.1955R. http://www.sciencemag.org/cgi/pdf_extract/262/5142/1955. Robock, A.; Ammann, C.M. ; Oman, L.; Shindell, D.; Levis, S.; Stenchikov, G. (2009). "Did the Toba Volcanic Eruption of ~74k BP Produce Widespread Glaciation?". Journal of Geophysical Research 114: D10107. doi:10.1029/2008JD011652. Bibcode: 2009JGRD..11410107R. Rose, W.I. ; Chesner, C.A. (October 1987). "Dispersal of Ash in the Great Toba Eruption, 75 ka". Geology 15 (10): 913–917. doi:10.1130/0091-7613(1987)15<913:DOAITG>2.0.CO;2. http://www.geo.mtu.edu/~raman/papers/RoseTobaFallGeology.pdf. Self, Stephen; Blake, Stephen (February 2008). "Consequences of Explosive Supereruptions". Elements 4 (1): 41–46. doi:10.2113/GSELEMENTS.4.1.41. http://elements.geoscienceworld.org/cgi/content/full/4/1/41. Steiper, M.E. (2006). "Population history, biogeography, and taxonomy of orangutans (Genus: Pongo) based on a population genetic meta-analysis of multiple loci". Journal of Human Evolution (50): 509–522. Thalman, O.; Fisher, A.; Lankester, F.; Pääbo, S.; Vigilant, L. (2007). "The complex history of gorillas: insights from genomic data". Molecular Biology and Evolution (24): 146–158. Williams, Martin A.J. ; Stanley H. Ambrose, Sander van der Kaars,4 Carsten Ruehlemann,5 Umesh Chattopadhyaya,6 Jagannath Pal,7 Parth R. Chauhan (30 December 2009). "Environmental impact of the 73 ka Toba super-eruption in South Asia". Palaeogeography, Palaeoclimatology, Palaeoecology (Elsevier) 284 (3–4): 295–314. doi:10.1016/j.palaeo.2009.10.009. Zielinski, A.; Mayewski, P. A.; Meeker, L. D.; Whitlow, S.; Twickler, M. S.; Taylor, K. (1996). "Potential Atmospheric impact of the Toba mega-eruption ~71'000 years ago". Geophysical Research Letters 23 (8): 837–840. doi:10.1029/96GL00706. Bibcode: 1996GeoRL..23..837Z. Zielinski, G. A.; Mayewski, P. A.; Meeker, L.D. ; Whitlow, S.; Twickler, M.S. ; Taylor, K. (1996). "Potential Atmospheric Impact of the Toba Mega‐Eruption ~71,000 years ago". Geophysical Research Letters 23 (8): 837–840. doi:10.1029/96GL00706. Bibcode: 1996GeoRL..23..837Z. http://faculty.jsd.claremont.edu/dmcfarlane/Joyce/Mulu%20ash/Zielinski__Atmospheric%20effetcs.pdf.